Website accessibility has become more important in recent years as several companies have been sued over the inaccessibility of their websites. This study involves the development of a software tool that evaluates the compliance of websites with the “10 quick tips” that provide guidance to web designers who seek to address the highest level concerns of the guidelines of the Web Accessibility Initiative. 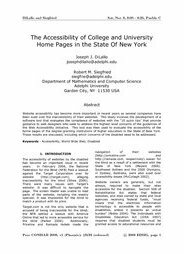 This tool was then used to evaluate the accessibility of the home pages of the degree-granting institutions of higher education in the State of New York. These results are discussed, including which concerns of the disabled need to be addressed.